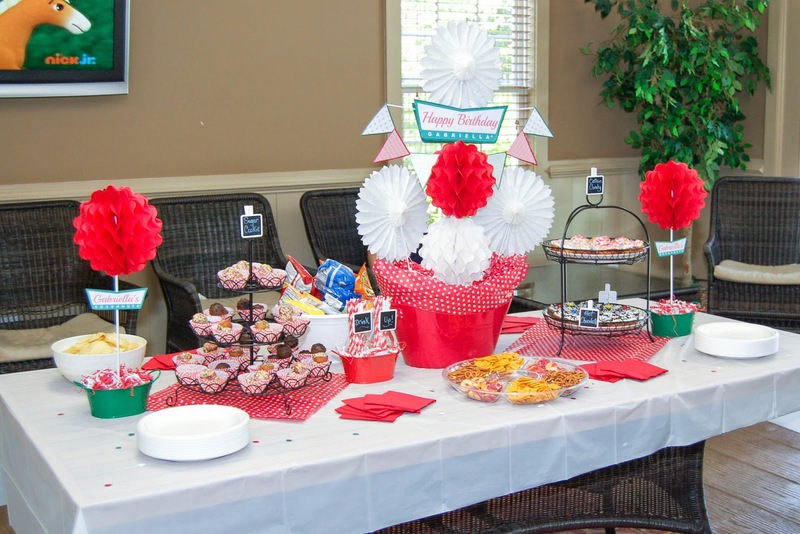 Here is a peek at the "Krispy Kreme" themed party. My daughter even wore her donut tee- shirt for the event. She spent all week helping me put together the decorations. The inspiration for the theme had come from Pinterest of course. My daughter was all for it, so when Party Pail contacted me to ask if I wanted to review some of their products, I knew exactly what I wanted. They sent me some white tissue paper fans, red and white honeycomb balls, and some red cocktail napkins. They have everything you need to throw a party in lots of different colors and themes, just go to partypail.com and check it out for yourself. 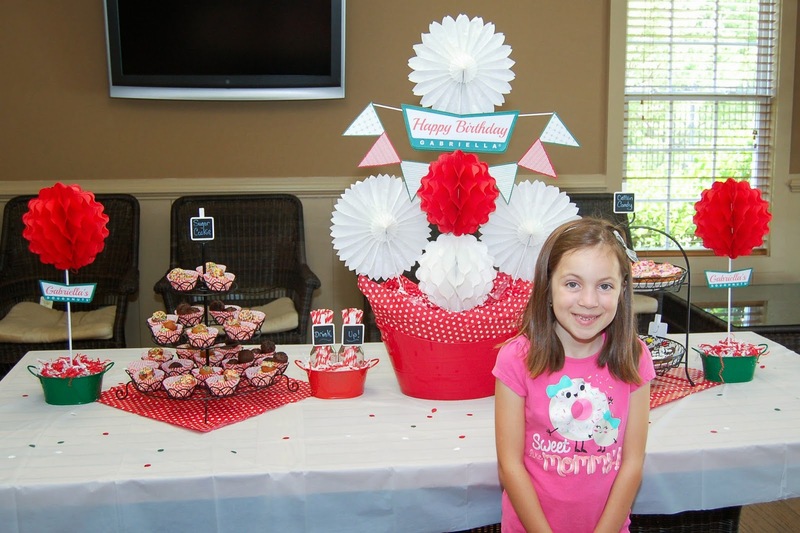 At first I was going to hang the decorations in a lovely pattern, but since I was not doing the party at home, I opted to be creative and make some decorations that were easily transportable. Party Pail's supplies worked out perfectly. I was able to make a fun centerpiece and some cute topiaries. The tissue paper fans and honeycombs balls were very sturdy and easy to work with. I would definitely recommend their products. 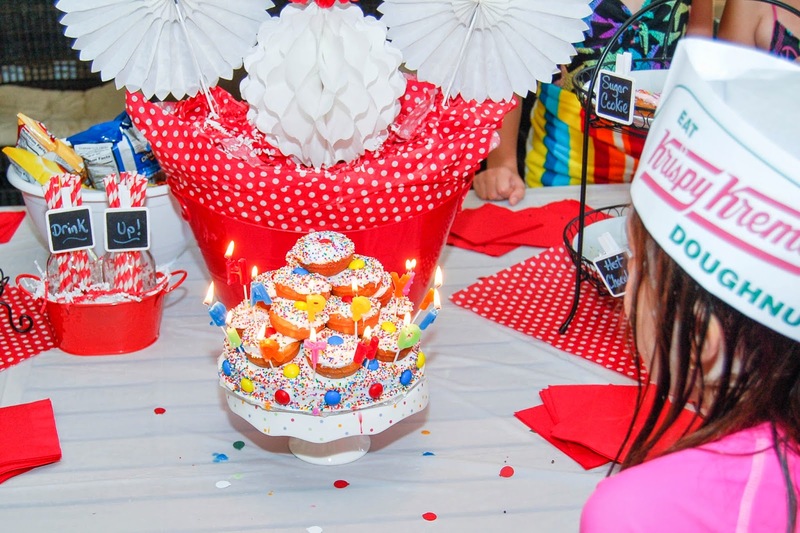 Here's a look at the donut cake. It was kind of an afterthought since I was concentrating so much on making all the other mini donuts, but all the kids loved it. What kid wouldn't love a stack of donuts? 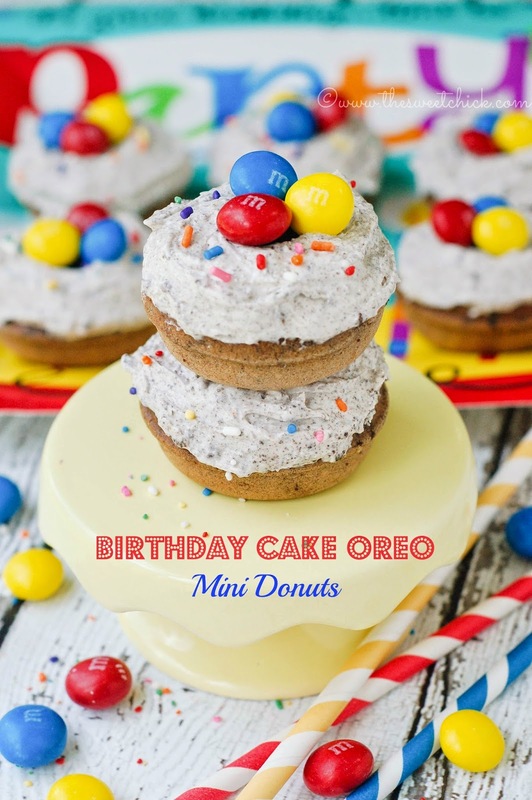 Back to the Birthday Cake Oreo Donuts. 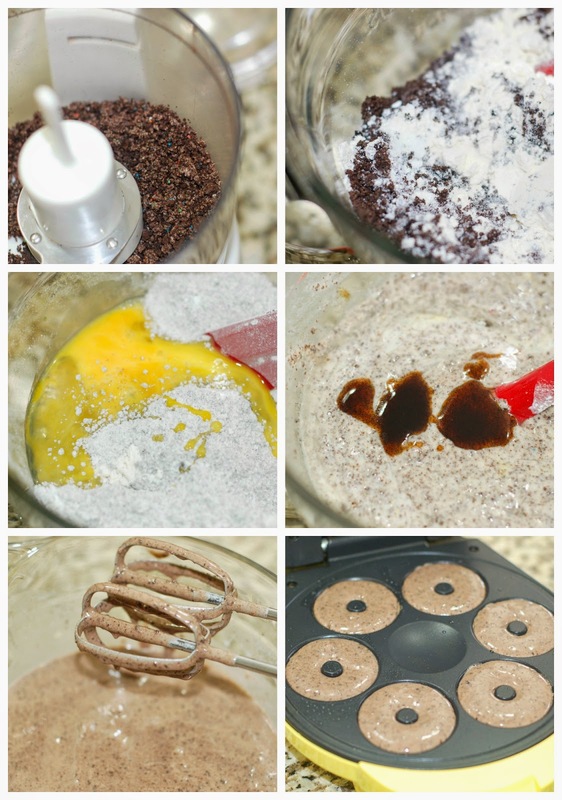 I adapted the recipe for my Mini Chocolate Oreo Donuts. I left out the cocoa and added extra crushed Oreos instead. I wanted to make sure not to lose the taste of the birthday cake cream. I used the chocolate ones, but I suppose you can try the golden ones also. Now the original recipe calls for buttermilk, if you have some on hand, that's great. I never do, so I just make a simple substitute of milk and vinegar and let it curdle. Typically you use white vinegar, but lately I have been using rice vinegar because it has a sweeter taste and my donuts have been coming out perfect. I use rice vinegar a lot for dinner recipes so I always have it on hand. I used my Babycakes machine to make these, which was great because it didn't heat up the whole kitchen. It's already hot enough outside, I really didn't want to warm up the inside of the house. You only need to bake them for 3-4 minutes. I just use the timer on my microwave, not the one on the Babycake machine. The frosting was super easy. 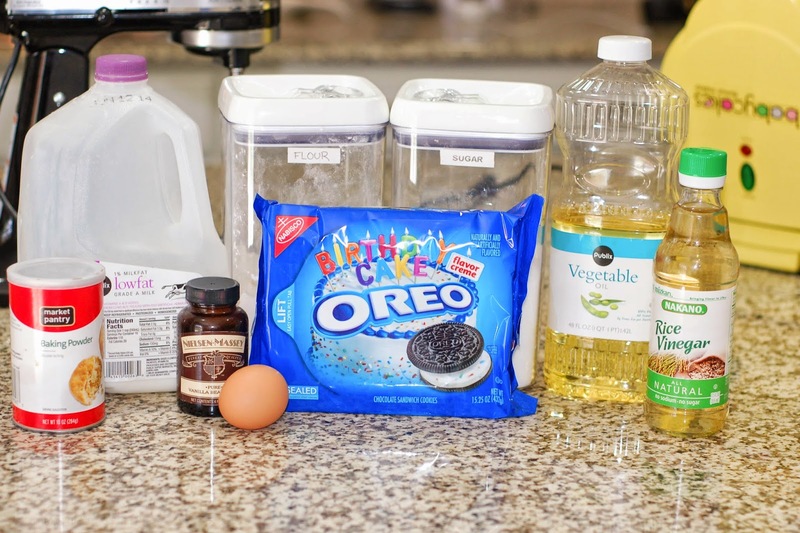 I just adapted a marshmallow fluff frosting recipe to include the crushed Birthday Cake Oreos. It's hard to decide which is the best part, the donut or the frosting. 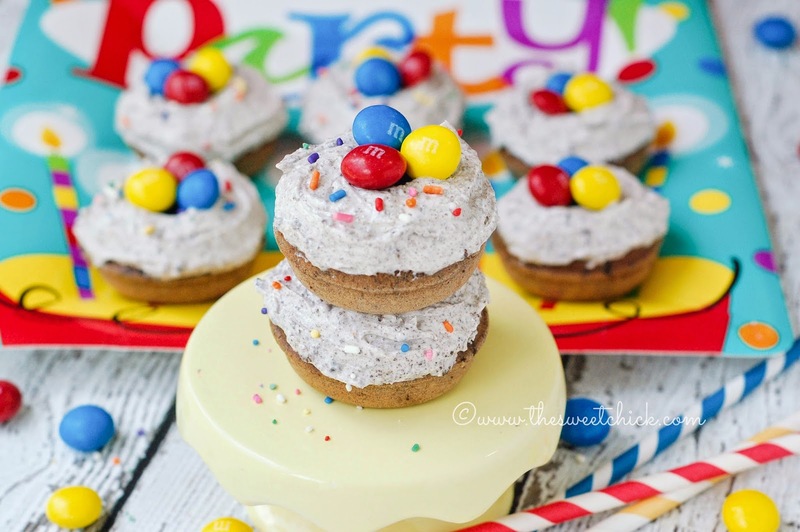 If you can find the Birthday Cake M&M's, they make a great topper for these donuts. I found mine at CVS pharmacy. When I originally tested this recipe, I did not glaze the donuts. They were eaten within two days, so no worries. For my daughter's party, I started baking the donuts on Monday for her party on Saturday. I didn't want them to dry out, so I did glaze them all before frosting them. They stayed nice and moist. The glaze was just a simple powdered sugar glaze. You can get the ingredients here. I don't feel the glaze is necessary if you are going to be consuming the donuts within two or three days. I did keep mine refrigerated for the simple fact that it's darn hot in these parts. That's why we had my daughter's party at the neighborhood pool clubhouse. Everyone was able to keep cool while celebrating. Now I have to start planning my son's birthday party. Place hot donuts on cooling rack and cool completely before frosting. 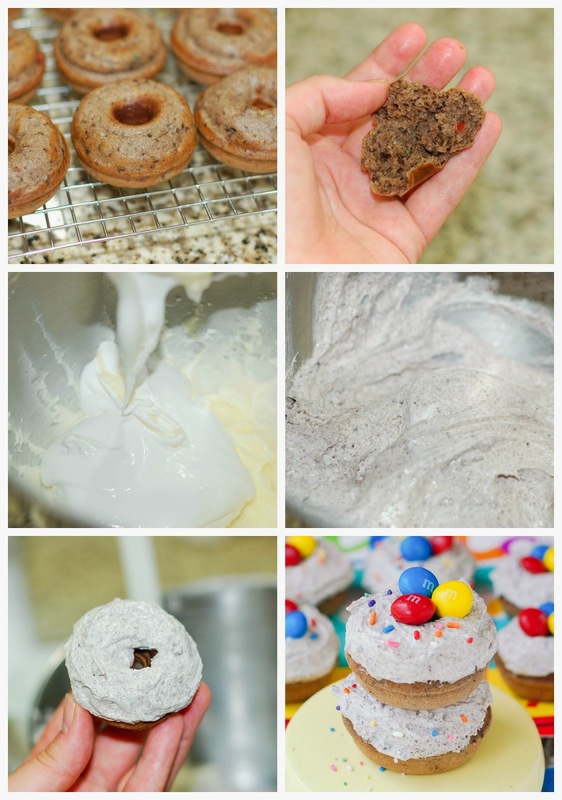 Feel free to top these donuts off with chunks of broken Oreos, sprinkles, or Birthday Cake M&Ms. Disclaimer: Party Pail did provide me with some products to review, but I was under no obligation to develop a recipe for them nor provide a favorable review. All thoughts and opinions are my own.